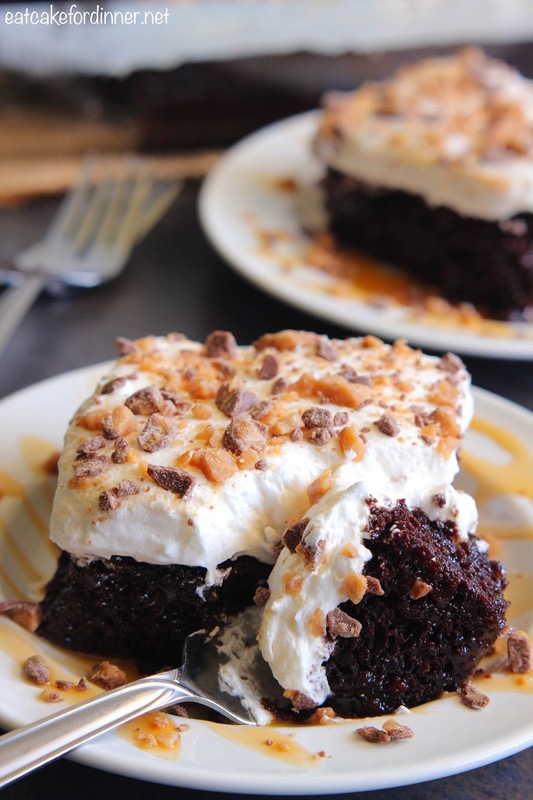 You know that classic Better than Anything Cake that's a chocolate cake drenched in caramel and sweetened condensed milk then topped with Cool Whip and toffee bits? Well, I made a zucchini version!! I had the idea for this cake forever ago. I put a reminder on my phone, so as soon as I had zucchini in the garden, I would remember to try it. So, every day, for 59 days, my phone reminded me about this recipe idea. Sure, I could have went to the store and bought some zucchini, but I just couldn't spend the few dollars on it when I knew I would be overloaded with it soon. I have now made this cake several times and it's really really easy. You don't even have to break out the mixer for this one, the cake is all mixed by hand and the other ingredients are already ready to go. Since this chocolate zucchini cake is already very rich and moist, I decided to smother the cake in only caramel sauce and not sweetened condensed milk. I like to top mine with Cool Whip, but if you prefer homemade whipped cream, you can absolutely use that instead. This cake is seriously incredible. 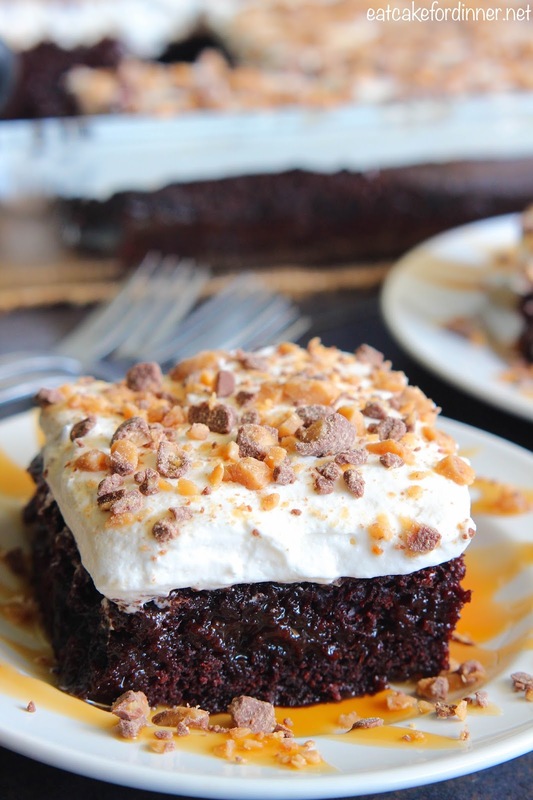 You can taste the caramel inside the moist chocolate cake and when combined with the sweet Cool Whip and rich toffee bits, this is guaranteed to be a huge hit. No one will ever know there is zucchini inside. Preheat oven to 350 degrees. In a large bowl, combine the oil, sugar, egg, vanilla and milk and whisk together until well combined. Stir in the zucchini. In a separate bowl, whisk together the flour, cocoa, baking soda and salt. Add dry ingredients to wet and stir together until just combined. Pour into a greased 9X13-inch baking pan. Bake in preheated oven for about 30 minutes or until a toothpick inserted in the center comes out clean. Remove from oven and cool for 20 minutes. Using the handle of a wooden spoon, poke holes all over the cake, being careful not to poke all the way to the bottom. Squeeze caramel all over the cake, filling in all the holes. I use the majority of the 20 oz. bottle, but save a little for garnishing the cake when serving. Refrigerate cake for several hours or overnight. 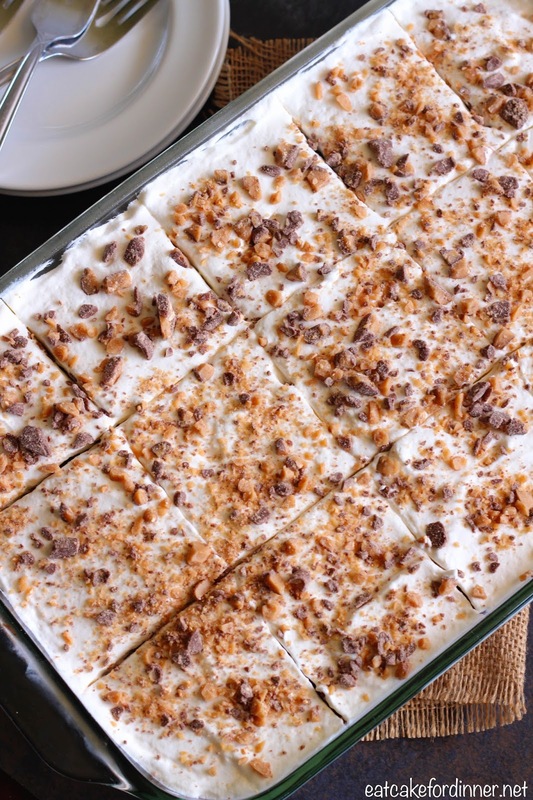 When ready, top cake with Cool Whip and toffee bits. Slice and serve. Once the toffee bits are added, this looks best within 24 hours, because they begin to melt on top. Although, it still tastes great for several days.